3) 17- ?? Howardson. Sorry forgot his 1st name. 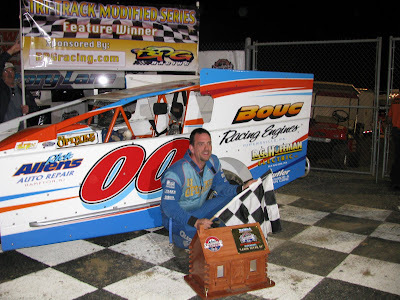 Last night New Egypt Speedway opened the 2009 season with what has to be considered a very successful evening of racing. The weather was perfect, the crowds were big, and the racing was very good...mostly. NES reconfigured the track so that it is less D-shaped and more symmetrical, and it looks like they put down all new clay. I really like the new track configuration. The surface was smooth all night. There was some dust, but after all,it is dirt racing, and none of it really got to me in the stands. The track seemed to get way too slick though, which made it very hard to pass at times...more about that later. Also, the front gate admission was raised $20 for a regular show, and last night's admission was $22. I won't complain about the money. I can just imagine the staggering costs that Bill Miscoski and his team must face to keep that place going. I feel that I got my $22 worth last night. In case anyone reading this has never been to New Egypt, it is in my opinion a world class dirt track facility: Excellent Musco lighting, modern stands, clean restrooms, free parking, great food, kid programs...you get the picture. NES has cut the classes to 3 divisions per night, which I think is great. Last night there were 22 Outlaw Stocks, 30 Sportsman and 41 Big Block Modifieds. There were a few things that I would like to see improve as the season rolls on. - The show took 5 hours. NES cut back to 3 divisions per night in 2009, they ran time trials for Outlaw and Sportsman, and the show still took 5 hours to get in the books? The Outlaw stock feature was checkered at 10:55 PM. With a late start, a 45 minute intermission to cut and water in the track, and some slow accident clearing in the Mod feature, it turned into a 5 hour show. Am I the only one who cares about this? What's going to happen when NES switches to a 7:00 PM start time? - Passing: As the surface dried out and rubber was laid down, it seemed like it got much harder to pass. The first two Mod heats were pretty racy, but by heat 4 the passing suffered. They cut and watered the track at intermission, so the Sportsman feature saw some good passing on a fresh surface. By the the Mods went out though, passing was tough. This really became evident in the Mod feature when Gary Butler, followed closely by Billy Pauch, caught the back of the pack (10 car), but could not pass a single lapped car. I hope I'm not coming across too harshly. I think the new surface is very promising, and I'm betting the racing will get even better as the season moves on. All in all, I think last night at New Egypt Speedway was a great opening night to the season. If you haven't been to New Egypt, I highly recommend you give it a try.